Signal Masts are configured using one of the available Signaling Systems, and the Signal Mast Types supported within that system. 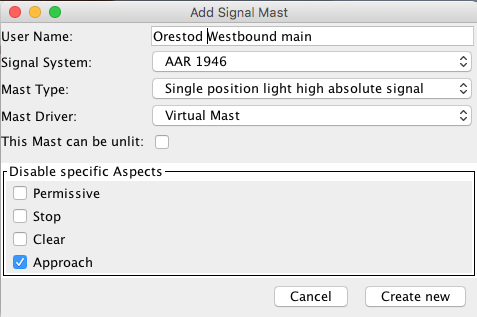 In the Add/Edit Signal Mast panel, after entering a User Name for the new Signal Mast, from the pop-up menu select the JMRI Signal System the Signal Mast is to be based upon. Next select one of the Signal Mast models available in the selected Signal System e.g. "3 Aspect Signal with Call On". The third pop-up menu on the Add Signal Mast panel lets you select one of six different Signal Mast Driver types depending upon the hardware being used. More on those in the next section. This Mast can be Unlit: checking this box allows JMRI to turn off the mast, using an extra instruction such as an output state. 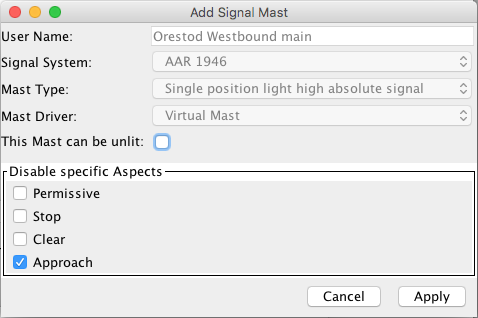 When configuring a mast that can be unlit, the same aspect ID has to be entered in both the field at the top as the Aspect line below for the correct appearance to be displayed in all possible scenarios. 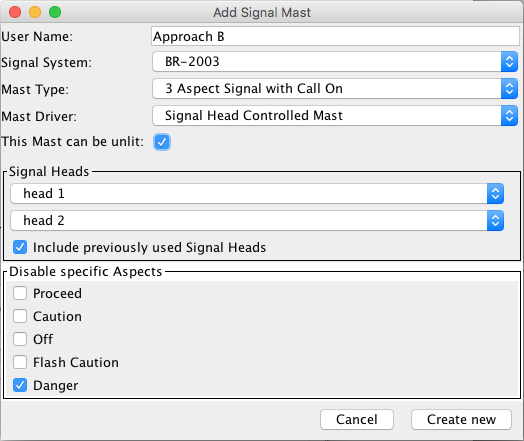 Copy Aspects from Mast: DCC, LNCP and Matrix drivers let you copy the settings for a new mast to match an already configured mast. Of course the User Name and outputs should be unique, so they are not copied. When ready, click Create new (or Apply when editing an existing mast configuration). Individual Signal Head objects are used to represent each Signal Head on the Signal Mast. Each Signal Head object will then deal with handling the changing of its Appearance depending upon the state of the Signal Mast and the position of this Signal Head relative to other Heads. For each head that has been defined in the Signaling System for the selected Signal Mast type, a drop down box will appear for you to select the JMRI Signal Head that will control that head on this Signal Mast. This Driver type is for specific hardware that can control the whole Appearance of a Signal Mast based upon the setting of one or more Turnouts. Depending on the hardware used the appropriate options will appear in the setup panel. This mast does not directly control any hardware relating to a Signal Mast. It is ideal for locations where a physical mast would not be present on the railroad, such as an End Bumper/Buffer Stop, or to mark the end of a signaling section of track and the beginning of Dark Territory. No commands are sent to the layout, so there's no connection to choose. This Driver type is for an accessory decoder that can drive the Signal Masts natively and supports the NMRA Extended Accessory Protocol. Enter the Aspect numbers configured in your decoder against each Aspect. The default values for the ID of each Aspect as defined in the Signaling System definition can be over-written. Decoders like the Signalist SC1 have Signal Mast types preconfigured and you just select the correct table with a CV and get the Aspect numbers from the manual. 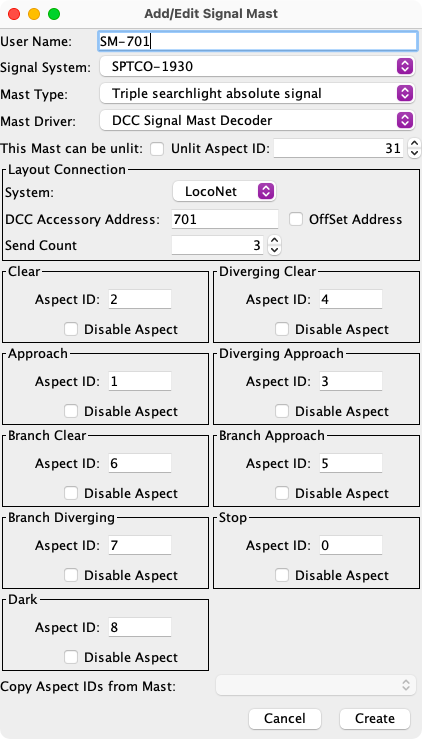 Like the previous option, the LocoNet Control Point (LNCP) Driver type needs only a decoder ID and optionally Aspect ID's to drive a RR_Cirkits LNCP module. This Driver creates a truth table to set from 1 to 6 outputs per Aspect. To define 8 different patterns, you will need at least 3 on/off fields. The Output Matrix driver was developed to connect decoders configured to connect and drive signals, like a Digirails DR4018 with built in aspect mapping set to match your JMRI signal system and mapping. 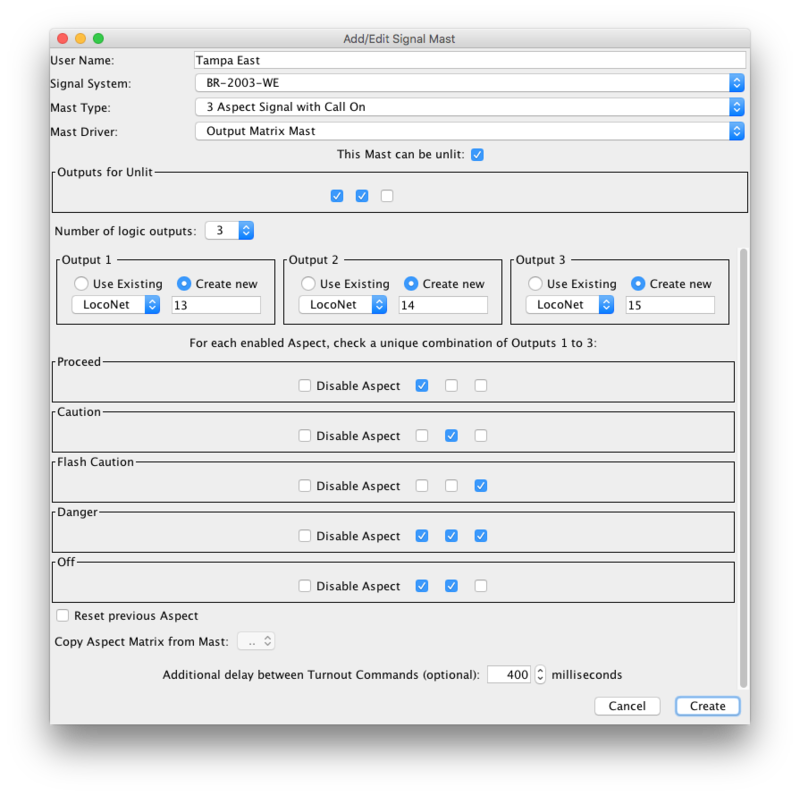 Set the number of logic outputs (3 in the screen shot, select from the Number of logic outputs drop down list). Output selection boxes. Select or create Turnouts as binary outputs. For now, only turnouts can be configured as outputs. Your decoder documentation will have to explain which Aspects are available and which output states the decoder expects for each Aspect. The output names and the Unlit row can be changed later on by clicking the Edit button in the Signal Mast table. It's not possible to change the number of outputs in the matrix once a mast has been saved. Click Create new to add the new Mast and return to the Signal Mast Table. Back to the Signal Mast Table help page.